I'm looking to hook my Polk audio powered subwoofer to my Star Wars...just looking for the best way. Just ordered this today to hook the PSW-10 to my SWLE (because even the Flipper Fidelity speakers didn't rumble enough for me!). Thanks. That's what I need...have the PSW -10 too, time to rumble! That's the best way to hook it up, I have them in all my games with powered subs. It hooks up the same way as on any other game, spike or non-spike. clips directly to cabinet woofer. I know that's how a lot do it, but I also know if you hook it up wrong (on the powered sub side), the current can actually damage the pins boards. Just being gun-shy with a new pin, and a new system (spike 2). He actually lost me on the word "clips." As a general rule, I don't like to clip anything to anything...you're asking for a short somewhere. Solder or bust, baby! Many people don't know how to solder and can do a lot of damage with an iron, especially in a tight spot. Yes, soldering, if done right, is more secure, but the risk of short with clips can be just as high or low as soldering. Using clips to hook up a sub is very safe and the spacing of the lugs is wide. The positive lug is usually labeled with a "+" or a red dot and typically is the lug on the right of the speaker. I can look on my sw pro tonight to confirm. Sorry for reviving this thread but was wondering if it's safe to just add the two wires to the same subwoofer connector that's on the Main board? 2 wires (red/black) go from the connector to the sub in cabinet and 2 wires (red / black) from the same connector to the amplified sub? It would work if your powered sub has high level inputs designed to take an amplified signal like the one from the pin's main board. Connecting as you describe would be equivalent electrically to alligator clipping or soldering wires directly to the existing pin's sub speaker terminals. Clipping or soldering the wires at the subwoofer terminals would be far less work and safer than messing with the connector to the main board imop. I have 8 pins with shaker motors wired up to powered subs with alligator clips directly attached to the Pin's subwoofer terminals without issues. If you are concerned about the alligator clips, then i suggest soldering the speaker wire at the pins speaker terminals (I do solder the alligator clips to the speaker wire for a better connection, but would rather not to crawl into my pin with a hot iron unless really necessary). It would not work if your powered sub only has low level inputs designed to accept a line level signal (very low power); you would fry your subwoofer and possibly your Pin because the signal level from the Pin would be way too high for the powered sub's pre-amp. Pinnovators (i believe) makes a kit that will properly add a line level tap to the main board's audio output; this line level tap could be used to drive a powered sub's low level input. For completeness, adding a non-powered sub (just a speaker) in parallel to the pin in this manner would reduce the impedance presented to the Pin's audio amp that could stress the Pin's amp causing distortion or even failure depending on the robustness of the pin's audio amp. The reason you can connect a powered sub with high level inputs in parallel like this is because those high level inputs on the powered sub present a very high impedance to the circuit which effectively makes the sub invisible to the Pin's audio amp. I used dayton audio's sub-1200 from part's express; they have high level and low level inputs. I am very satisfied with these. This free advice comes with no warranty. I have a 10" Polk sub, the same as everyone else, and a DP Pro coming in very soon. When I hooked the sub up to my old Spiderman, I used basic male/female wire connectors spliced a few inches back from the cab speaker terminal. This way I could simply disconnect the sub and reconnect the original speaker when I had to move or sell. 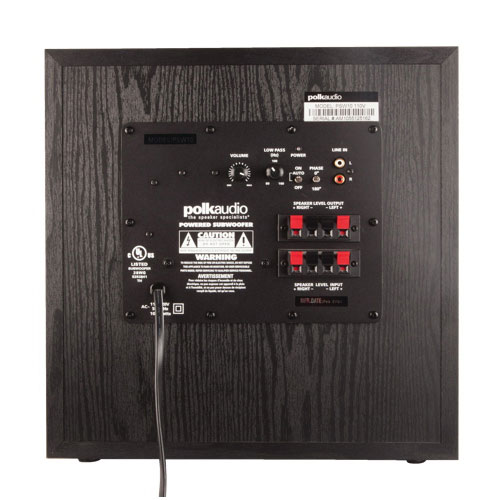 1 - With the sub clipped or soldered to the original cab speaker... is there enough power to properly power the cab speaker? Wouldn't adding the sub in addition stress the amp? 2 - What the benefit of using the Pinsub system? The ability to adjust the volume for the machine AND the sub at the same time? - I can't remember, but I thought the sub volume changed whenever I adjusted the machines volume from the coin door... I could be wrong though. the external sub is self powered, it's not pulling anything from the game except a signal. So is that a yes to my question? This high input low input response confused the hell out of me. I was going to hook it to my polk sub using the speaker level inputs. You can run two wires from the cabinet sub to a powered external sub without issue. Flash instinct. The sub speaker level inputs are the high level inputs. You can connect the pin subwoofer directly to your speaker level inputs and it will work properly. Not all subs have speaker level / high level inputs as yours does. It would not be correct to connect the subs output to the line level inputs without a line level adapter. Somebody let me know how a sub sounds on a DP, I may do one on mine. Subs almost always sound good on a modern game. The cabinet speaker isn't tuned properly (open air for a speaker that should be enclosed), so it really doesn't deliver a nice low end. Something as "simple" is building a sealed enclosure for the cabinet speaker (a la TNA) would be enough to bring out the bass on the cabinet speaker well enough where you probably wouldn't need a sub...but who wants to do that? So we buy powered subs (or one of the other aftermarket speaker solutions). Market idea. A competent wood worker could easily build a speaker box for Sterns to lay on top of the the cabinet speaker. Build in some gasket type material to the open side (to create an air-tight seal) screw down and voila! Instant speaker enclosure! Sounds great, have one on mine.